This is another strategy game that will surely keep you in front of your computer for quite a while because the zombies arent so polite and you will have to kick their butts. Do your best to select the troops that you want to control and then send them wherever you like on the map. 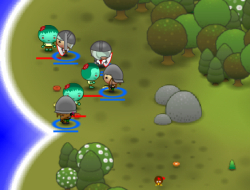 Try to fight efficiently if you want to survive this game and you will definitely do your kingdom a really big favor by getting rid of all those brainless creatures that are roaming around. Kingdom of Zombies 10.00 between 0 and 10 based on 1 votes.